Eddie Daniels is that rarest of rare musicians who is not only equally at home in both jazz and classical music but excels at both with breathtaking virtuosity. Expert testimony from the jazz world comes from the eminent jazz critic Leonard Feather, who said of Eddie, "It is a rare event in jazz when one man can all but reinvent an instrument, bringing it to a new stage of its evolution". From the classical side Leonard Bernstein says, "Eddie Daniels combines elegance and virtuosity in a way that makes me remember Artur Rubenstein. He is a thoroughly well-bred demon". Eddie first came to the attention of the jazz audience as a tenor saxophonist with the Thad Jones-Mel Lewis Orchestra. When Thad and Mel first organized their band in 1966 to play Monday nights at the Village Vanguard in New York (where it still plays) Eddie was one of the first musician they called. Later that year he sank $400 in a round-trip flight to Vienna to enter the International Competition for Modern Jazz, a contest organized by the pianist Fredrich Gulda and sponsored by the city of Vienna, and won first prize on saxophone. He continued working with Thad and Mel over the next several years and toured Europe extensively with them. A single clarinet solo recorded on a recording with the Thad Jones/Mel Lewis Orchestra, Live at the Village Vanguard, garnered sufficient attention in 1968 for him to win Downbeat Magazine's International Critics New Star on Clarinet award. This conversion to clarinet was not new, however, for Eddie began studying clarinet at age 13 and received his Masters in Clarinet from Juilliard. When he subsequently began recording as a leader he concentrated on the clarinet. Jack Elliot, musical director of the New American Orchestra, was so impressed with Eddie's playing on an early CBS recording that he commissioned Jorge Calandrelli to compose a major work for him. 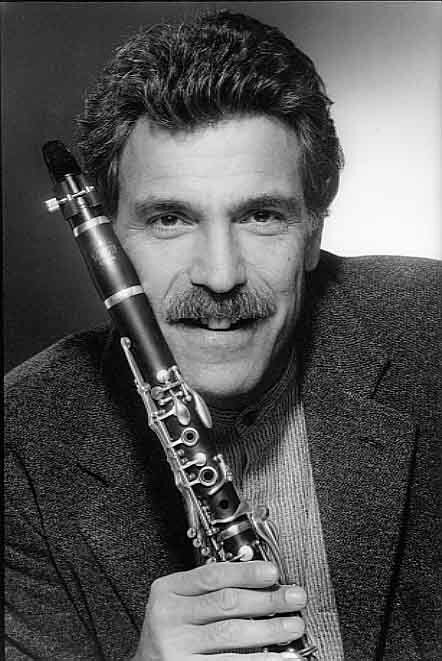 The result was "Concerto for Jazz Clarinet and Orchestra" which Eddie premiered in Los Angeles in 1984. This work became the centerpiece of his debut GRP album, Breakthrough, recorded with the Philharmonia Orchestra of London. Of this recording, which also includes pieces by JS Bach and CPE Bach, Quincy Jones said, "Eddie's debut album for GRP will become the benchmark to judge all future recordings blending the world of classical music and jazz." Upon its release Breakthrough achieved overwhelming critical acclaim, with Downbeat magazine referring to Eddie's ". . perfect synthesis between classical technique and jazz sensibility" and his".... blinding virtuosity." Eddie followed it with To Bird With Love, an album dedicated to Charlie Parker. His third album, Memos From Paradise, teamed him with pianist Roger Kellaway, a rhythm section, and a string quartet. All three of these albums earned Grammy nominations (Bird garnered two) and Memos won a Grammy. Eddie continued his diverse recording pattern with his two subsequent albums, Blackwood and Nepenthe. On his next album, This Is Now, Eddie returned to straight ahead jazz fronting a burning jazz trio led by Billy Childs. Simultaneously he released The Brahms and Weber Clarinet Quintets on Reference Records recorded with the Composers String Quartet. In 1992 he began a collaboration with vibist Gary Burton, recording an album titled Benny Rides Again, devoted to the music of Benny Goodman and Lionel Hampton. Greeted with overwhelming critical and popular response they have toured together playing the music from the album at jazz festivals and concerts throughout the United States, Europe, Japan, and Latin America. Eddie's most ambitious recording project to date is Vivaldi: The Five Seasons (Shanachie) released in 1996. Recorded with the Los Angeles Chamber Orchestra and a jazz rhythm section, Eddie pushes the envelope of his breathtaking virtuosity by performing the solo violin part on the clarinet as Vivaldi wrote it, improvising in the classical style, and improvising in the jazz style, all of it seamlessly interwoven in new arrangements by Jorge Calandrelli. Eddie's latest recording is Beautiful Love, Intimate Jazz Portraits (Shanachie), recorded with his longtime friends and associates guitarist Chuck Loeb and keyboard great Bob James. Eddie's personal appearances reflect the diversity of his albums. He has performed at jazz festivals and jazz clubs with his quartet, the music from Breakthrough with the Cincinnati Symphony, the Rochester Philharmonic, and the Indianapolis Symphony, as well as with the Boston Pops for Public Television. On a single concert program he has performed the Mozart Clarinet Quintet, material from Memos From Paradise, and duo improvisations with Roger Kellaway. In the classical field he has performed with orchestras including the London Symphony, the Rotterdam Philharmonic and the Tokyo Symphony. and the Polish Chamber Orchestra, as well as the Vermeer, Orlando, Suk, and Composers String Quartets, in concerts throughout the United States, Europe, and Japan. Eddie Daniels is clearly a renaissance musician, a virtuoso in both jazz and classical music, recipient of unreserved accolades from his peers, from critics, and from the public. Eddie's overriding ambition is to reach as many people as possible with his music, to enlarge the audience for both jazz and classical music and at the same time to tear down the walls separating them. In Eddie's hands the music of Mozart can be as engaging as that of Charlie Parker and a concert featuring both can be a uniquely rewarding experience for the audience.